O. A timeline of events related to the current June-August 2014 Conflict may be found on the We Are For Israel website here. 1. Hamas took over Gaza from the Palestinian Authority in 2007. Israel had withdrawn all of its citizens including all of its military from Gaza in 2005 and Egypt has been in control of the Rafah Border Crossing since that time. Hamas believes that it is the duty of every Muslim to fight against the existence of the Jewish state and that terrorism against civilians, including women and children, is legitimate and will eventually work. Haviv Rettig Gur’s article about Hamas’ mindset is a must read. Hamas has conducted numerous terrorist attacks through the years in which it sends men and women with explosive belts into Israeli cities to kill themselves along with as many Jews as possible. Hamas is recognized as a terrorist organization by the United States. 2. Hamas, an offshoot of the Egyptian Muslim Brotherhood and its ally, celebrated the ascension of the Muslim Brotherhood in Egypt. Later it came to both promote and support attacks, some by other militant groups, in the Sinai Peninsula against the current Egyptian government led by Al Sissi. These attacks including a particularly bad one in August of 2012 that left more than a dozen Egyptian soldiers dead resulted in Egypt launching a major operation in 2013 to close most smuggling tunnels into Gaza along with closing the Rafah border crossing into Egypt. 3. Hamas began to fire rockets, mostly mortars and relatively inaccurate Qassam rockets, at Israeli communities sporadically even before Israeli disengagement from Gaza in 2005. But beginning in 2006, rocket and mortar fire into Israel became a regular occurrence. This was several years prior to the Naval Blockade enforced by Israel in 2009 and which came only after longer range and much more deadly rockets were used by Hamas. By Winter of 2009, several thousand rockets had been fired at Israeli cities not just along the Gaza border but further afield. The Israeli city of Sderot received much attention because of its bomb shelters and programs for children with Post-Traumatic Stress Disorder. Israel launched Operation Cast Lead in December 2009. This article by Alan Johnson in the Daily Telegraph does a good job of summarizing the history of events surrounding rocket fire and the blockade. 4. In May of 2010, the Free Gaza Flotilla sailed from Turkey to Gaza in an attempt to break the Israeli naval blockade of Gaza. While international attention was focused initially on such things as limited medical supplies, some of which were actually useless and primarily for symbolic value, later all attention came to be focused on the violence aboard the Mavi Marmara. The primary cargo carried to Gaza by the flotilla was cement [remember this because it is now extremely important]. 5. In 2011, Hosni Mubarak, Egyptian Dictator and an ally of the Fatah Party and Mahmoud Abbas, was deposed in favor of Mohammed Morsi, the leader of the Egyptian Muslim Brotherhood. Over the ensuing year, the border between Gaza and Egypt was entirely open. 6. Starting in March 2012, Hamas begin firing rockets including longer range Grad rockets into Israel. Israel responded with Operation Returning Echo, a five day operation that ended with a ceasefire on March 14, 2012. 7. Over the course of that year, Hamas added medium range M-75 rockets capable of reaching the outskirts of Tel Aviv and Jerusalem to its arsenal. Initially, these rockets were brought in from Iran into Sudan, potentially having been assembled and/or stored at the Yarmouk weapons factory outside of Khartoum which the Israeli military struck in October 2012, and then into Gaza primarily via smuggling tunnels in the Sinai, though some fishing vessels may have also been used to deliver them. With the open border and possibly because of the destruction of the weapons it may have been expecting to come from Yarmouk, Hamas launched a new rocket based operation against Israel in November of 2012. The use of longer range rockets was the primary reason for Israel launching Operation Pillar of Defense (aka Pillar of Cloud) in 2012, an eight day operation that was highlighted by the effectiveness of the newly introduced Iron Dome anti-missile system. Hamas agreed to a ceasefire in November, 2012 that has been in effect for the past two years prior to June of this year. 8. Since the Winter of 2012, Hamas began trying to bring in Iranian/Syrian made M-302 extended range rockets capable of reaching 80% of Israeli cities from Gaza and doing substantial damage when they strike. In March of 2014, a ship known as the Klos-C carrying M-302s from Iran was captured by the Israeli navy while trying to deliver dozens of M-302S to Gaza, but it is clear that many more arrived via other means, most likely crossing the border from Egypt prior to the end of 2013 when Egypt began closing smuggling tunnels in earnest. 9. June 2, 2014 the Palestinian Authority announced the creation of a Palestinian Unity government that would include representatives of Hamas as well as those of Fatah, the primary party in the West Bank led by PA President Mahmoud Abbas. Hamas’ primary goal in joining the Unity Government was to open the door for funding to come to pay its 40,000 employees in Gaza. 10. With the Egyptian closure of both the Rafah border crossing and most of the smuggling tunnels in 2013, Hamas has become increasingly weakened and faces the likelihood of losing any fair election to be held in Gaza at this point. Hamas is unable to convince the Egyptians to open the border or to persuade the Israelis to end the naval blockade. The Palestinian Authority’s desire is to end independent Hamas control over Gaza and to restore the PA’s control there in some fashion, if not completely. 11. Hamas’ current plan according to Gershon Baskin, who has communicated directly with Hamas’ leaders, is to force a compromise agreement upon Egypt and the Palestinian Authority by engaging Israel in a conflict that leads to many Palestinian deaths and brings outside pressure upon the situation. The primary goals of its current efforts are to attain a ceasefire agreement that would result in the opening of the Rafah Border Crossing currently closed by Egypt and the payment of the 40,000 Hamas employees what they are owed as well as ongoing payments. It is not inaccurate to say that Hamas is firing rockets at Israeli civilians and utilizing offensive military tunnels from Gaza into Israel in a manner requiring Israel to kill many Palestinian civilians so that Egypt and the Palestinian Authority respond to its demands. 12. Hamas not only locates its weapons and personnel in or nearby normally protected facilities such as UN Schools, Hospitals, Mosques and civilian housing, but also encourages civilians to gather around its weapons and discourages them to flee when notified. It was discovered today that Hamas used a UNRWA School situated between two other UN schools currently housing 1,500 refugees each to house rockets. The combination of all of these things is a clear attempt to use human shields. Here is a report by an Indian TV reporter of Hamas setting up a rocket next to several hotels and apartment buildings and here is a report from a French TV reporter in Gaza of a rocket launcher set up right next to the hotel were most journalists were staying and also right next to a UN facility. Israel meanwhile feeds this practice by regularly calling off strikes against targets when civilians are present. By no means is it the case that civilians are not killed when they do not evacuate targeted sites. They are, and there are certainly also errors on Israel’s part such as the tragic killing of four children near a Hamas target on a beach. Unfortunately, by embedding its personnel and weaponry among civilians, Hamas has created a situation in which Israel has no choice but to respond when Hamas attacks from targets where there are civilians present. 13. There is no reasonable argument to be made for Israel to relax its naval blockade of Gaza instituted because of rocket fire coming from Gaza from 2006-2009 because of the massively increased level and severity of rocket fire in the ensuing years. If anything, it is assuredly the case that such a blockade has now been proven essential to Israel’s security. 14. Israel knew that there were “offensive” tunnels dug between Gaza and Israel that were primarily designed to attempt kidnappings of Israeli soldiers, but which also could be used to conduct damaging terror attacks (See this article from Yisarel Medad and this one from J.J. Goldberg for example). [Hamas did in fact fund the kidnapping and eventual murder of the three teens which some argue started this current conflict- for more on the timeline see this article]. Israelis did not, however, whether they should have or not, realize the extent, quality, or severity of the threat that they faced until July 17th, when thirteen Hamas commandos crossed through a tunnel into Israel near Kibbutz Sufa with the intent of either capturing or wiping out the population of the Kibbutz. Israel then launched a ground operation to find and destroy other similar tunnels. The US government estimated that at least sixty similar tunnels likely existed and that some were also more substantial. One tunnel into Egypt was 1.5 miles long, 66 feet deep, contained electricity and had provisions including food placed along its length to accommodate travelers. The basis of this argument is an understanding of Hamas’ smuggling tunnels into Egypt and the fact that similar tunnels could be created into Israel. There are now jokes circulating that Hamas may have already completed a tunnel into the West Bank from Gaza. The belief is that Hamas has used tens of thousands of tons of concrete to build tunnels and bunkers in Gaza which cost it into nine-figures in dollars and that the threat from these is much greater than previously assumed. 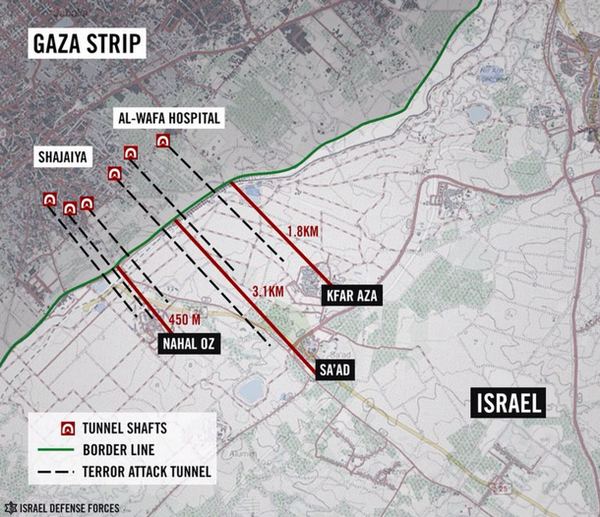 Israel has already stopped several attacks coming from these tunnels during Operation Protective Edge. It is important to note that such a tunnel would have almost certainly been used to move the three kidnapped Israeli teens into Gaza had they not been killed and that had it succeeded, Hamas certainly would have claimed the kidnapping. The New York Times published an excellent article on the tunnel to Nir Am on July 25 that includes a video. See also this article by Jodi Rudoren or this one by Melanie Lidman with more details about the tunnels and a discussion of how they impact the Israeli psyche. 15. On July 22, Delta Airlines, United Airlines, and US Airways cancelled flights into Ben Gurion Airport. Following these decisions, the US FAA banned US air lines from flying into Ben Gurion for 36 hours because a Hamas fired rocket landed near the airport. This reaction may be an over-reaction based on the shooting down of a Malaysian Airlines plane in Ukraine in combination with US issued travel warnings. Other airlines followed suit. Hamas is now firing rockets at Ben Gurion Airport in order to disrupt the functioning of the airport and Israel has held flights in holding patterns for periods of time when rockets are in the air. It turns out that there rocket that triggered the FAA ban was deliberately let through by the Iron Dome crew because it would not hit Ben Gurion or any vital targets. Israel’s intercept policy has now been widened near Ben Gurion in response to FAA wishes. 16. How likely is a ceasefire soon? Here is the ceasefire situation in a nutshell. US Sec. State Kerry is in the region trying to promote a 5-7 day ceasefire during which negotiations on a longer term ceasefire could take place. At this point, there are two basic ceasefire proposals being proposed. 1. An Egyptian one supported by the Palestinian Authority and to which Israel has agreed that grants none of Hamas’ demands and 2. A Qatari one which grants almost all of what Hamas wants. The Egyptian one is supported by all of the nationalist Arab governments including Jordan, Bahrain, and Saudi Arabia as well as by the United Nations and the United States. Israel has agreed to the Egyptian proposal already. The Qatari one is supported by the Islamist governments including Turkey. Each of these sides wants the other to concede and both sides are willing for the Israel-Hamas fight to continue if the other side does not concede. 17. The Kerry ceasefire initiative presented on July 25 granted Hamas both important immediate concessions and the increased likelihood of obtaining longer term ones. The immediate ones were the halt of very successful Israeli operations in Gaza against Hamas tunnels, the ability to relocate personnel and weaponry, and the time to establish new defenses against possible future Israeli efforts as well as to assess and prepare future offensive plans. In exchange for this brief ceasefire, Israel may have received 5-7 days without rocket fire, amounting to a simple delay in that rocket fire if no longer term agreement is reached. The long term proposal brought by Sec. Kerry was seen by Israel as essentially being the pro-Hamas Qatari ceasefire proposal “with adornments.” Hamas was evidently leaning toward accepting this ceasefire which was clearly to its advantage to accept. The Israeli Cabinet, reacted with incredulity to it and unanimously rejected the proposal, but accepted a 12 hour humanitarian ceasefire that spanned 8 am – 8 pm on July 26. Israel unilaterally agreed to extend the ceasefire for several hours, but Hamas broke the ceasefire shortly into the extension. Further undermining trust in US mediation and adding to the harsh reaction from receiving the proposal which leaned heavily toward the Hamas position is the fact that following submitting it, Sec. Kerry went to Paris and met with representatives from Qatar and Turkey, Hamas’ closest allies. Here are several important articles to read on this issue which will certainly affect future negotiations involving Sec. Kerry and the United States: Two articles by Barak Ravid of Haaretz (What was he thinking? and Kerry’s Ceasefire Draft Revealed), one by David Horovitz (John Kerry: The Betrayal), one by Ari Shavit (John Kerry Risks Causing Escalation), one by Avi Issacharoff (Kerry’s Mistakes Strengthen Hamas’ Resolve) and one by Elhanan Miller (Abbas Fumes at Kerry). 18. Both the Israeli leadership and a very broad spectrum of the Israeli public is angry and dismayed by the approach taken to this situation by Sec. Kerry. They have not as of yet begun to blame President Obama specifically. Here are a few quotes from the articles mentioned above that demonstrate the extent of the disquiet on the Israeli political LEFT. The draft Kerry passed to Israel on Friday shocked the cabinet ministers not only because it was the opposite of what Kerry told them less than 24 hours earlier, but mostly because it might as well have been penned by Khaled Meshal. It was everything Hamas could have hoped for. With proper management, the military success could have been translated to a certain extent into a significant diplomatic victory: The Egyptian initiative. But over the weekend, U.S. Secretary of State John Kerry ruined everything. Very senior officials in Jerusalem described the proposal that Kerry put on the table as a “strategic terrorist attack.” His decision to go hand in hand with Qatar and Turkey, and formulate a framework amazingly similar to the Hamas framework, was catastrophic. It put wind in the sails of Hamas’ political leader Khaled Meshal, allowed the Hamas extremists to overcome the Hamas moderates, and gave renewed life to the weakened regional alliance of the Muslim Brotherhood. 19. The rejection of the Kerry ceasefire proposal came as new information came to light concerning the nature of the tunnels and Hamas’ rumored plans for them. From a factsheet distributed by Omri Ceren, a senior advisor at The Israel Project, July 25, 2014. Leaks have begun to trickle out on what Israeli interogators are learning from captured Hamas fighters. One plot in particular is getting overwhelming attention. Hamas was apparently a few months away from conducting a mass attack on Israeli civilians during the upcoming Jewish holiday of Rosh Hashana, on September 24. The raid would have been like something out of a movie: hundreds of heavily-armed Hamas fighters would have emerged from over a dozen underground tunnels in the dead of night, jogged 10 minutes to their targets, and then infiltrated a set of lightly-populated and lightly-guarded Israeli communities. Casualties could have reached the thousands, and some of the victims would have been taken back alive as hostages. The offensive attack tunnels seem to quite literally have been built for this kind of purpose. The IDF recently published a map of how they were dug to spill out on both sides of nearby communities. Israeli soldiers have been reporting that just inside some of the tunnels were storage units filled with tranquilizers, handcuffs, ropes, and so on. The reports on this are mostly in Hebrew right now. The Gatestone Institute’s Lawrence Franklin has the best English-language version I’ve seen so far. The veracity of the accusation of a Rosh Hashanah mega-attack is now being questioned as in this piece by Anshel Pfeffer, however the location of tunnels and the contents discovered in tunnels do support the charge that they were designed for terror operations and for kidnapping. An article in the Times of Israel suggests that kidnapping soldiers like Gilad Shalit may have been a primary purpose. 20. The timeline (also on the We Are For Israel website) from the kidnapping and murder of the three Israeli teens, to the fight between Hamas rockets and Iron Dome, to the search for offensive tunnels shows how the conflict developed and morphed between June 12 and July 26 of this year. 22. There are differing opinions as to whether or not a successor to Hamas would be worse or better. The operative position of the US government appears to be that any likely alternative to Hamas in Gaza would be worse, potentially affiliates of the Islamic State (On this see Guy Maayan, Josh Rogin and Eli Lake, and Phil Stewart). However, it is very clear that others see a different path including Egypt, the Palestinian Authority, Saudi Arabia and members of the Israeli Cabinet. It is unknown whether or not PM Netanyahu believes that something worse than Hamas would be its likely successor. 23. On July 28, the UNSC and President Obama demanded an immediate ceasefire and Israeli said “No.” A Channel 10 poll late Sunday showed 87 percent of the public would like Operation Protective Edge to continue, and 69 percent want Hamas to be toppled entirely. Only seven percent say they want an immediate ceasefire, and six percent answer that they don’t know. So Pres. Obama’s and the UNSC’s position on an immediate ceasefire is opposed by 87-93% of the Israeli public right now. Israelis do not want to have a major fight every two years or less in Gaza. Most now seem to agree with Oren and Yadlin at least to a significant extent and want Hamas greatly weakened, disarmed, or removed from power following this current Israeli military operation, not an unknown number of years from now after a “possible” peace agreement is reached. See this article from July 29 on the ongoing Israeli support even from the opposition party leadership. JJ Goldberg writes that there is disagreement within the Cabinet about the goals with Netanyahu in the pro-ceasefire camp. 24. July 29, a ceasefire proposal that would have allowed for a 72 hour truce that was proposed by Egypt and the Palestinian Authority was rejected by Hamas and has rejected a 24 hour ceasefire agreed to by Israel. 25. A good article by David Horovitz on why PM Netanyahu is reluctant to order a full scale invasion of Gaza in spite of substantial pressure to do so. 26. A good primer on Hamas’ military development and capabilities by Elhanan Miller, one on the difficult rules of engagement in Gaza by Mitch Ginsburg, and one on the IDF’s difficulty searching for tunnels by Avi Issacharoff. 27. Israel has now called up an additional 16,000 reserves and is implementing plans for a longer operation aimed at addressing tunnels and the Israeli Cabinet has said that Israel will accept no truce until after that is accomplished satisfactorily. The focus of Israeli operations is not yet to either disarm Hamas or remove it from power. 28. UNRWA schools have repeatedly been found to be used by Hamas for military purposes. Rockets have been discovered within UN School compounds three times thus far and three IDF soldiers were recently killed by a booby-trapped tunnel opening within a UNRWA medical clinic. 30. August 1, a 72 hour humanitarian ceasefire agreed upon by both sides and brokered by the United Nations had been in effect for a mere hour and a half when Hamas sent a suicide bomber to attack IDF forces in Rafah, killing two and resulting in the capture of a third, Hadar Goldin of the Givati Brigade. 31. August 5, a 72 ceasefire to allow for negotiations in Egypt on a longer term ceasefire went into effect based upon the unilateral ceasefire proposal which was promoted by Egypt and accepted by Israel three weeks ago. The ceasefire was then violated August 8. Another ceasefire went into effect August 11. 32. Estimates are that Israel killed roughly 1000 Hamas fighters. Out of a high estimate of 1,800 or so deaths in Gaza, that would mean that a low estimate of combatant to civilian deaths is 1:1. Because there is no accurate accounting of deaths in Gaza and because Hamas wants to inflate the civilian to combatant ratio, true numbers will be unknown. Many of the deaths were caused by Hamas and Islamic Jihad rockets. Some were no doubt of natural causes. Hamas will declare all to have been killed by Israel. We also know that Hamas will underestimate the number of fighters killed and overestimate the number of civilians because that suits its strategy of pressuring Israel to make concessions because of Palestinian deaths. Here is an article in the New York Times by Jodi Rudoren and another by Michael Totten about the differences in estimated casualties. The reality is that critics of Israel are unlikely to believe Israel’s numbers are accurate and therefore will believe the worst about Israel and often apply that sentiment to Jews generally. The reverse is also the case. 33. Please see Izzy Lemberg’s article about the absence of journalistic integrity in covering Gaza as well as the article by Sreenivisan Jain for NDTV in India with full background information about their report concerning Hamas rocket fire. 34. David Horovitz’ assessment of the end of the current conflict as of August 6 is worth reading. 35. Hostilities renewed August 19 with Hamas rocket fire and an Israeli airstrike targeting Mohammed Deif. It is uncertain if Deif was killed in the strike. 36. August 20, Israel conducted a strike on a meeting of senior Hamas leaders in Gaza including Hamas head of southern command Mohammed Abu Shamaleh, Rafah commander Raed Al-Attar, and senior weapons smuggler Muhammad Barhum. Abu Shamaleh and al-Attar were involved leadership over the abduction of IDF soldier Gilad Shalit and in numerous other attacks. The Shin Bet named al-Attar as one of the architects of Hamas’s offensive tunnel operations in southern Gaza and as the head of the division that killed Israeli soldier Lt. Hadar Goldin while attempting to kidnap him. Al-Attar was also allegedly responsible for smuggling weapons into Gaza from Sinai. Barhoum was a senior Hamas operative in Rafah and also responsible for smuggling weapons into Gaza from neighboring Egypt. 37. There are realistically four possible outcomes for the aftermath of this conflict as I see them. Hamas remains in power while retaining border control and therefore Israel and Egypt will maintain the current sealed status of overland crossings as well as heightened efforts to prevent smuggling. The naval blockade will be maintained. Fishing rights may be slightly extended and perhaps prisoners will be released. The population of Gaza will continue to suffer until the next time that Hamas decides to fight, at which point the population of Gaza will both suffer worse and people will die because of it. This is essentially the status-quo with slight changes after this conflict. The Palestinian Authority takes over effective border control with Egypt and the Rafah border crossing is opened with supervision by Egypt and the Palestinian Authority. Life slightly improves with more coming through the Rafah crossing, but in a highly limited fashion due to ongoing security concerns for Egypt and the PA. Hamas remains the defacto authority within Gaza. Fishing rights will be extended. The Israeli border will remain sealed and the naval blockade will remain in place. The Palestinian Authority takes over Gaza after Israel removes Hamas from power. Naval blockade remains in place for a time. Israel works with the PA to supervise border crossings. Life for Gazans improves tremendously and security concerns greatly improve. Hamas maneuvers a weakening of restrictions on access to Gaza without ceding control of Gaza or its borders, strengthens in the coming years, and continues its fight against Israel’s existence. This entry was posted in We Are For Israel and tagged background, ben gurion, Gaza, gazans, Hamas, history, Israel, Palestinians, protective edge, Rockets, terrorism, tunnels. Bookmark the permalink. This is up to date information of the conflict in Israel that the media will be addressing soon. The news often is not accurate.